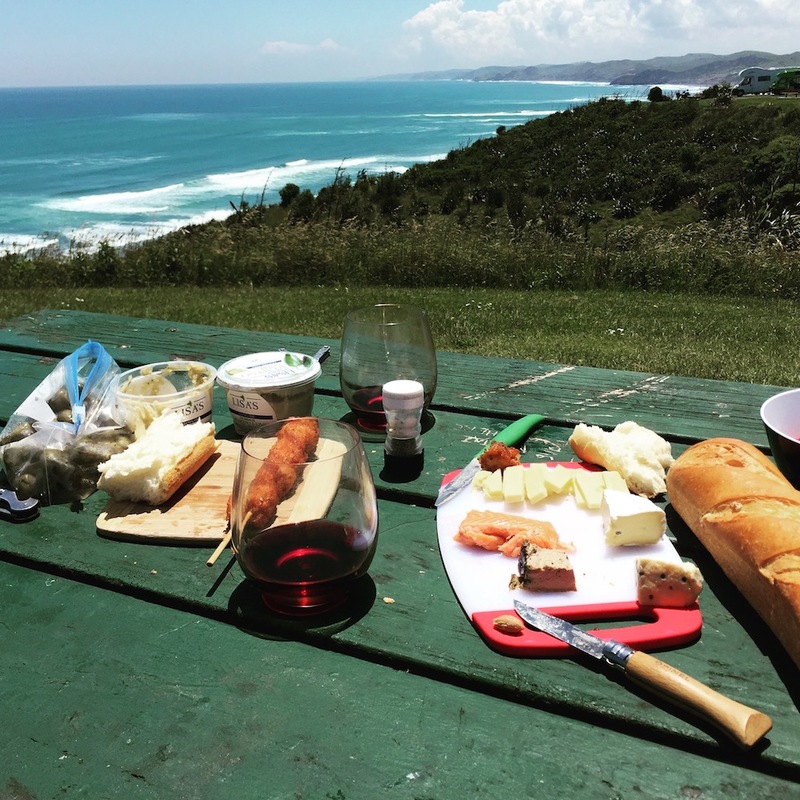 Back in December, I blogged about the first half of our fantastic New Zealand road trip, and I promised to tell the rest of the story later. Though several months have passed, this tale of getting to be a fan girl is a fun one to share. Back in the 1970’s when my first husband and I were building our 55-foot sailboat in Ventura, California, I was writing articles for the sailing magazines. I was also working nights as a waitress at the Pierpont Inn and weekends at the Island Hunter Bookstore in Ventura Marina. The bookstore owner, Karin Jensen, let me “borrow” all the books I wanted, and I took the opportunity to read all the great sailing yarns by the likes of Hal Roth, Francis Chichester, Irving Johnson, John Guzzwell, Miles Smeeton, and, of course, Lin Pardey. 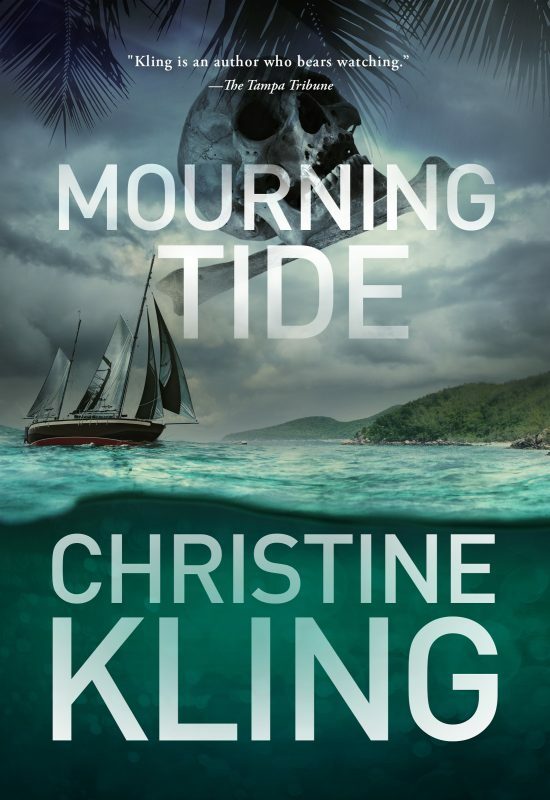 I dreamed of writing books like all the writers I was reading, but I didn’t think our cruise in the South Pacific had been noteworthy enough for a book, so I came up with an idea for a different book. I called it Blue Water Women, and the book was going to tell the stories of cruising women. I wanted to submit a sample chapter and outline, and I knew Lin Pardey was also in California while she and Larry were preparing to build a new boat, so I reached out and set up an interview. 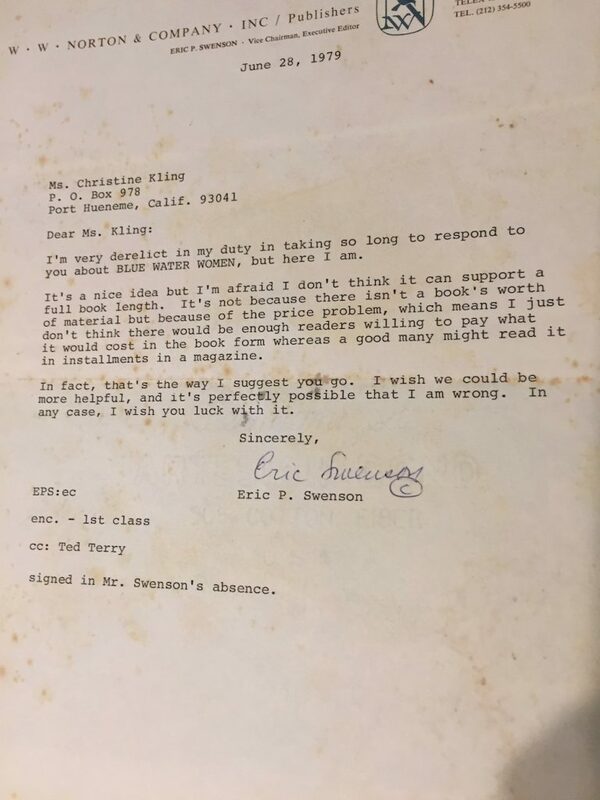 Alas, publishers in those days were not yet ready for the book, and when I dug the old pages out of storage, I found the file filled with rejection slips. In the end, it would be another twenty years before I wrote and published my first book, the novel Surface Tension. 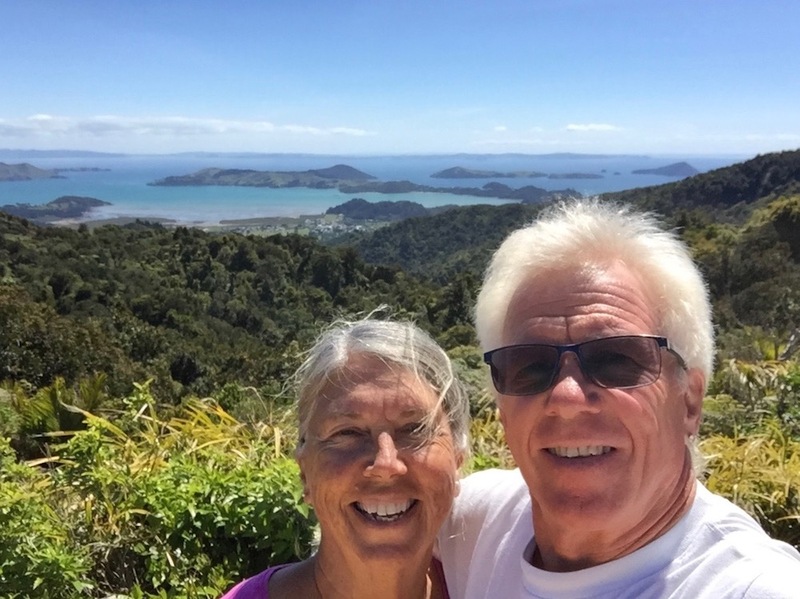 Lin and I connected again several years ago at the Annapolis Boat Show, but while we were down in New Zealand, I contacted her and she graciously invited Wayne and I to visit her at her home on Kawau Island. We stayed at a lovely bed and breakfast place in Warkworth, so we drove out to the ferry at Sandspit and parked our car. The day had started overcast, but the clouds cleared and we had a fabulous view of Lin’s house as seen above when the boat dropped us off at her dock. Lin and Larry bought the property and remodeled the buildings that were already there. The little building in the right of the photo is Lin’s writing studio. It’s every writer’s dream location. 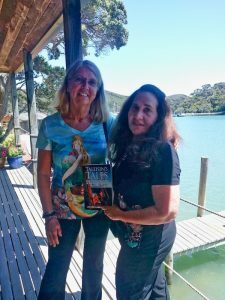 Lin recently released the book Taleisin’s Tales: Sailing Towards the Southern Cross that tells about the adventures she and Larry shared in the boat they were starting to build when I first met them. Lin prepared us a lovely lunch, and we got the chance to talk about writing and sailing over good food and wine. 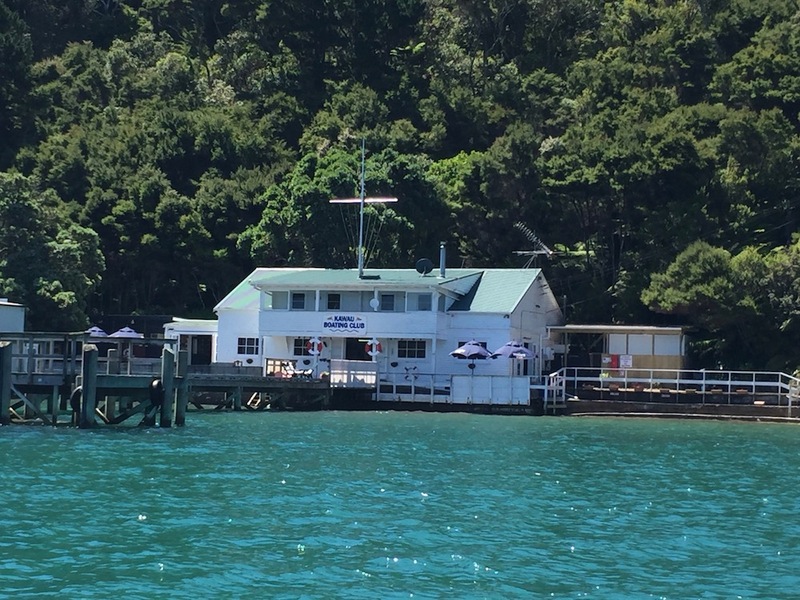 After a tour of the property, including Larry’s boatbuilding workshop, we took off with Lin in her little fizzy boat to tour the island and see the Kawau Boat Club, a place she and Larry have helped to keep a lively social spot for the island residents and visiting sailors. Although I wasn’t nearly as shy as I’d been 40 years earlier, I remain in awe of Lin. She lives life with a grace and enthusiasm that the years have not dimmed. Her laughter is infectious and all that personality comes through in her writing. For any writer who wants to understand “voice,” just read Lin’s work. She dropped us off at the ferry landing, and I hope we will meet again soon out on the water. 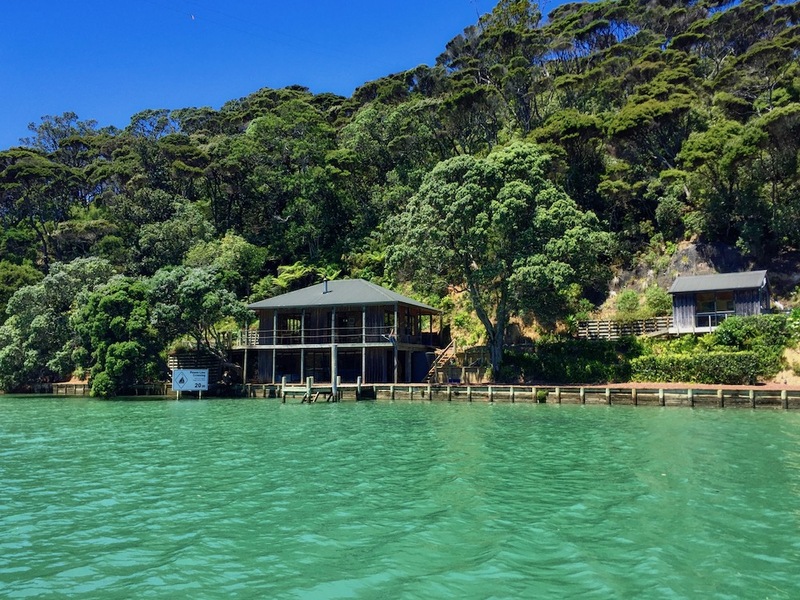 and driving all around the Coromandel Peninsula. 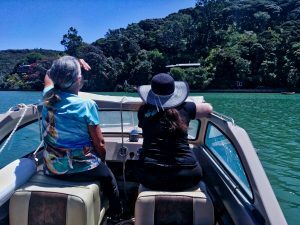 But the one thing that I will remember most about our road trip around the North Island, was the afternoon I spent as a fan girl with Lin Pardey. Thanks Jan. I’ve been going through old photos and I came across one of you and Frank on Sunrise. Good memories. I truly enjoyed this article, and all your columns. I know just how you felt, meeting a favorite author. When I met Joyce Carol Oates, I couldn’t form words. My mouth was too dry. Please keep these columns coming! Stephanie- I’ve had the same thing happen so many times. Like the time I tried to talk to Sue Grafton at Sleuthfest. No words! Wow..a flash from the past..well remembered…Thank you for sharing and stirring up memories from the Island Hunter bookstore days….Good days it was for all of us….! Karin, good days indeed. The Island Hunter Bookstore days certainly were a formative part of my life. Thanks go to you for creating such a unique place. And I’m a fan girl of yours. Can’t wait for your next book. Hopefully it’ll be in New Zealand?